Here it is the end of March and I haven't posted hardly anything. I have been tatting though. 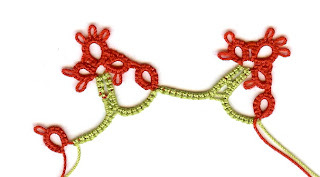 I am working on my Bocher Models for The Online Tatting Class. Here are some of the patterns I have been working on. I have no pictures to help with the patterns. So sometimes it is a guess as to where they picots or joins are suppose to be. In one pattern I work one of the sections call for an extra picot which made the ring larger. I couldn't find anything to tell me different so I made it that way. Then I made another one with out the extra stitches and I thought it worked out much neater. 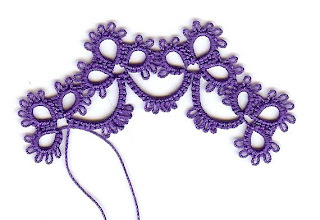 This purple piece is called an edging but it has a lot of curve to it and would need to go on a circle project. The first one of these i made was in green and I was going to use it on a journal page for my sister's flower journal I am making, but.....Sadie had other plans and I only found bits and pieces of it on the floor. I try very hard to make sure any tatting is put up where she can't find it. She can destroy something in a matter of minutes. This morning she grabbed a ball of tatting tread and I had to bribe her with a treat to get it back. I am still working on this pattern. It is difficult to get it to lay flat with the instructions that I have. I am going to try it using two shuttles to see if I can get a smoother look to the pattern. I do like it and think in a finer thread it would look great as a hanky edge. Here it is done in size 20 and the bottom blue one in size 10. I don't remember what thread I used. I have been working on Easter Eggs. I will have to wait to post them as I have not scanned them yet. Yesterday we had horrible weather, snow, sleet, rain and more snow. They were saying we had black ice this morning so I did not go to work. That means I can join the Online Tatting Class at three today instead of 8 tonight. The sun is out now and most of the snow is melting. I will be so glad when Spring really gets here and the snow is gone for a few more months. This last piece is the first time through on an edging. I like the pattern and think it too would look great on a hanky. Since I have lots of nieces and great nieces I can practice a lot on hankies for t hem. I don't care for the red and green I used but it was on the shuttles and I need to finish them off so I could put on something else. 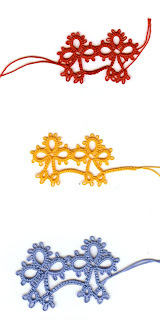 All three of these patterns are from the Bocher Book we are restoring for the Online Tatting Class. I am still having issues with my new glass and that makes it difficult for almost everything I try to do. I am thinking I will go back and have the lines put back in them so I can see what I am looking at. This weekend I was having issues with reading a book and when I was working on my sister's journal the pages moved ever time I turned my head. Not a fun feeling. I love the purple edging! I agree, it would look great on a round piece. I really like the way the yellow looks, too!